Tumors located aborally to the carina, i.e., Barrett's carcinoma or carcinoma of the esophagogastric junction, may be removed by a left-sided thoracotomy instead of the more usual right-sided access combined with an abdominal approach. 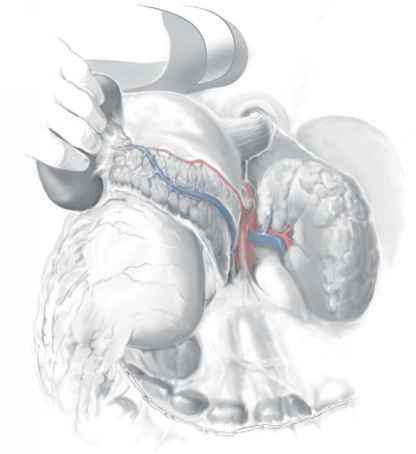 The extent of lymphadenectomy is limited to the middle and lower mediastinum. Contraindications ■ See chapter on "Subtotal Esophagectomy: Transhiatal Approach"
■ See chapter on "Subtotal Esophagectomy: Transhiatal Approach"
The skin incision is made obliquely from the epigastrium toward the sixth or seventh intercostal space, and a good exposure of the mediastinum or abdomen can be achieved by rotating the operating table. After 1 cm of costal cartilage is resected, the left side of the chest is opened. 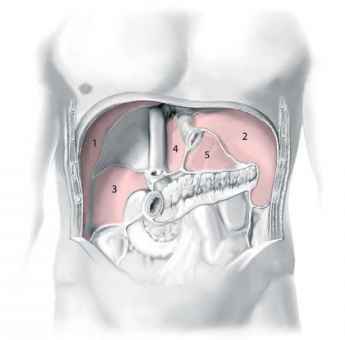 Distant and peritoneal metastases should be excluded prior to thoracotomy. Para-aortic lymphadenectomy is performed by delivering the splenic flexure into the chest through an incision in the peripheral diaphragm. 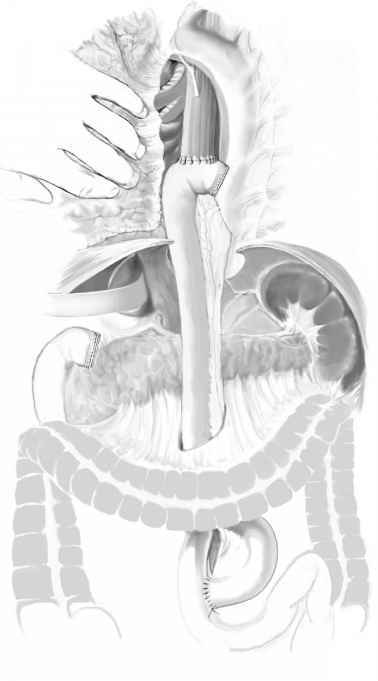 The descending colon is then mobilized down the left paracolic gutter to the base of the sigmoid colon mesentery. After mobilization of the left kidney from the retroperitoneum as well as pancreas and spleen, the left renal vein is identified. The para-aortic lymph nodes in the left lateral region are then dissected, and the right lateral para-aortic lymph nodes are removed after performing a Kocher maneuver. Lymph nodes of the hepatoduodenal ligament and around the common hepatic artery, left gastric artery and celiac trunk are dissected. 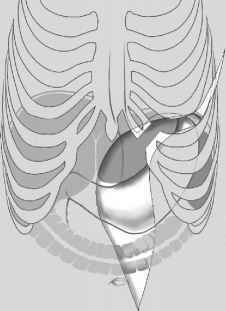 Regarding the left intrathoracic approach, the left pulmonary ligament is divided and the mediastinal pleura is opened. The pleura covering the lower thoracic esophagus is incised, allowing the clearance of loose connective tissue together with the lower thoracic paraesophageal, supradiaphragmatic, posterior mediastinal and intradiaphrag-matic lymph nodes. 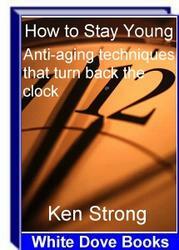 There are several methods of reconstruction according to the tumor location and extension. 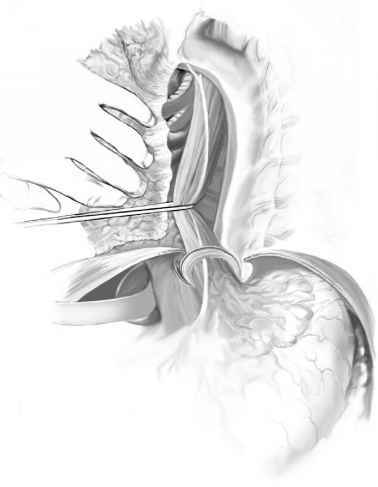 Roux-Y reconstruction by using an EEA instrument, as shown here, is an option for performing the esophago-jejunostomy. See chapter on "Subtotal Esophagectomy: Transhiatal Approach"for standard postoperative investigations and complications. 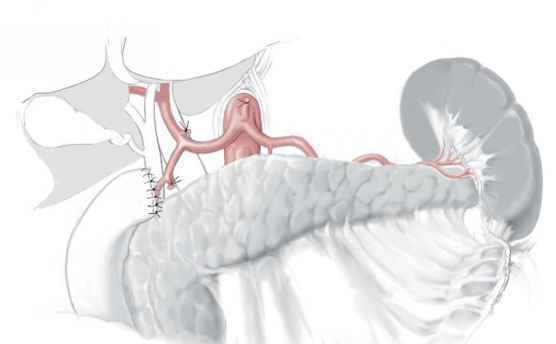 ■ Kinking of the graft: this is a rare but dangerous complication, due to clinical symptomatic disturbance of the gastrointestinal passage by elongation, which requires surgical intervention and is performed by shortening of the graft. ■ If the trachea is injured, use direct suture and pericardial flap. How close is the lower bowel to the paraaortic lymph?